I love traveling. Except for the part about the schlepping of the stuff, especially the bulky, heavy stuff such as travel cribs. So I was intrigued to learn that there was a new (parent-designed) travel crib in town, and then find out that journeyBee delivers what it promises. Weighing in under 12 pounds (about half the weight of other play yards), and decidedly easier to schlep (the crib folds down flat and comes with a travel bag), it takes about 2 seconds to pop open and maybe 5-20 seconds (depending on how good you are at following left/right instructions) to fold down. I initially wondered about the coziness of a crib that sits directly on the floor (compared to footed travel cribs), but journeyBee has a nice, thick mattress pad and fleece cover sheet. 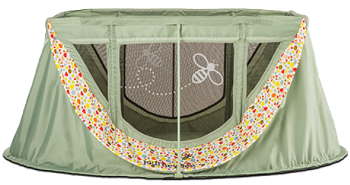 journeyBee starts shipping this Saturday (just in time for holiday travel) and is a great pick for families who want a portable crib that's easy to transport, set up, and break down. At $149 it's in the ballpark of its competitors, and while I can't guarantee that your flight or car transit will be smooth sailing, I can guarantee that creating a cozy nest at your destination will be a piece of cake with journeyBee.